It was timing, serendipity, creativity, really good college educations, nudging parents and a sharp sense of international trends that culminated in the popular Midcentury ceramicware company known as Holt-Howard. Throw in a loan from two sets of parents in the amount of $9,000 (approximately $87,000 in 2012, according to the U.S. Inflation Calculator), who must have seen something in their sons’ endeavors. During its hey-day—the 1950s and 1960s—Holt Howard was the king of whimsical ceramics. Copycat ceramic studios came close, but none could compare, which is why its Pixieware has $3,000 asking prices on eBay and other online auction sites. Brothers John and Robert (Bob) Howard met A. Grant Holt while attending the University of Massachusetts Amherst in the early 1940s. Later in the decade—after John served in and was wounded in World War II, Bob got a master’s degree in business administration from Harvard University and Grant did post-graduate work in Sweden—the friends reconnected to look into that business they’d always thought about starting up. While Holt was in Sweden, he saw potential in a couple of Christmas decorations: a paper star intended to hang in windows and thin metal angel chimes, called Angel-Abra, which became quite popular. A company was born. With their cute, animated faces and atomic shapes, Holt-Howard’s holiday ceramics were a hit with young Midcentury American consumers who didn’t want their homes to mirror those of their parents. Bob Howard—a longtime artist—did many of the designs and sketches, along with a few other artists. While not a popular concept today, Holt-Howard joined other companies of the era in lowering manufacturing costs by taking production overseas. The main showroom was in New York, eventually moving to Stamford, Connecticut. Perhaps the most iconic line of Holt-Howard ceramics is its Pixieware, which began in 1958 with striped mustard, ketchup and “jam ‘n jelly” ceramic jars with lids or toppers in the form of funny elfin heads. Individually boxed and intended as giftware, Pixie jars were manufactured for four years. The line expanded to include coffee containers, “Spoofy Spoons,” sugar and cream crocks, and jars for cherries (cocktail and regular), olives (cocktail and regular), onions (same), relish, honey, mayonnaise, chili sauce, salad dressing, liquor decanters, cruet sets, hors d’oeuvre dishes, salt and peppers, teapots, planters, and even towel holders. Cartoon cats were popular in the 1950s: remember Felix and Tom & Jerry? Holt-Howard introduced its almond- and doe-eyed Cozy Cats line in 1958. Collectible Cozy Cats and Kittens include salt and peppers, string holders, ashtrays, bud vases, cottage cheese crocks (yes, you read that correctly), butter dishes, sugars and creamers, condiment jars (the same molds as Pixieware), spice sets, match holders, cookie jars, and a “Keeper of the Grease” crock. Remember when people used to keep jars of grease and bacon fat under the kitchen sink? Imagine cleaning 50-plus years of collected pan drippings out of one of these crocks—not a job for the queasy ones. 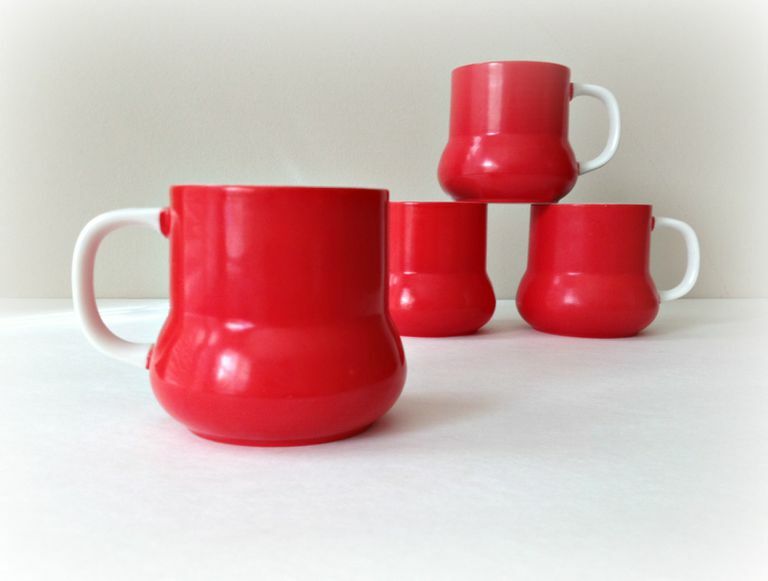 Roosters were all the rage for kitchens in the 1950s and 1960s—it was considered very “French.” Holt-Howard delivered with its Red Rooster Coq Rouge dinnerware line, which was introduced in 1960 and designed by Bob Howard. The line was carried through the 1970s by department stores like JC Penney, Sears, B. Altman, Macy’s and Bullocks. The more collectible pieces include rare giftware like ashtrays, vases, and figural salt and peppers. Other popular ceramic serve and giftware companies imitated or were heavily influenced by Holt-Howard, including Lefton, Lipper & Mann, Betson, Napco, DeForest, American Bisque, Lego (ceramics), Commodore and Py. In 1968, Holt-Howard was bought by the General Housewares Corporation and headquarters were moved to Hyannis, Massachusetts. By 1974, The Howard brothers and A. Grant Holt had left the company to pursue other businesses. What remained of Holt-Howard was sold to Kay Dee Designs of Rhode Island in 1990; there is no longer a Holt-Howard ceramics company in operation. Several years after the company was sold, two of the three principals started another company. Bob Howard passed away in 1990, and his partners in Holt-Howard, Grant Holt and John Howard formed Grant-Howard Associates. In the early part of the century, they produced several look-a-like lines, piggybacking on the popularity of the Pixieware and Cozy Cats line. Quite a few pieces were produced, but they were all different pieces than the original line. e.g. The Pixieware cookie jar was popular with consumers but was never made by the original Holt-Howard Company.